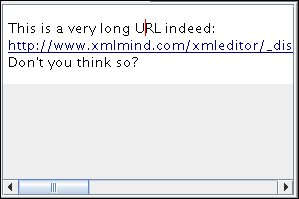 This option, which slightly modifies the behavior of word wrap in both the tree view and in the styled view, is useful to deal with long URLs and with languages such as Japanese or Chinese which do not use spaces between words. The following options parameterize the CSS style sheet used to visualize the document or to print it. Setting some of these preferences will have no visible effect if the style sheet author has specified the corresponding properties in the style sheet. For example, if the user's preferred background is specified in the CSS stylesheet defaults subsection as being light yellow and if the style sheet author has specified the root element background-color as being white, the document will be rendered with a white background. Specifies the font family used for property value font-family:serif. Default: Serif (the Java™ default serif font family). Specifies the font family used for property value font-family:sans-serif. Default: SansSerif (the Java™ default sans-serif font family). Specifies the font family used for property value font-family:monospace. Default: Monospaced (the Java™ default monospaced font family). Specifies the font family used for property value font-family:cursive. Specifies the font family used for property value font-family:fantasy. Specifies the default value for property font-family. Default: the "sans-serif" font family. Specifies the default value for property font-size. See also View → Text Size. The following options allow to configure the fonts, colors and level of details of the tree view. Except for "Fonts and colors", the following options apply only to the ``stand-alone'' tree views. 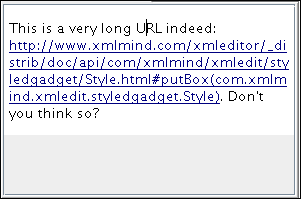 That is, they do not apply to the ``mini'' tree views embedded in a styled view (e.g. DocBook colspec and spanspec elements are rendered as ``mini'' tree views within the styled view). The sizes of all the fonts used to render a tree view are computed relatively to this font size. See also View → Text Size. Displays a dialog box allowing to specify the fonts and colors used to render a tree view. Toggles the display of the attributes in the tree view. Toggles the display of text node characters in the tree view. Toggles the display of comment node characters in the tree view. Toggles the display of processing-instruction node characters in the tree view. When showing element tags, also show table tags, that is, row group, row and cell tags. Default: not checked. By default, table tags are hidden because showing them makes the table structure hard to understand. When a document is created or opened, its styled view automatically displays the element tags. Specifies whether the images referenced by a document should be loaded after the body of the document, in a background task. The images are loaded at the same time as the body of the document. This means that when opening a document, you'll not see the body of the document until all the referenced images are loaded too. This option is well-adapted to images stored on the local filesystem, which is generally fast. The images are loaded after the body of the document, in a background task. This means that when opening a document, you'll quickly see the body of the document and after that, each image referenced in the document will be revealed one after the other. This option is well-adapted to images stored on remote filesystems (WebDAV, FTP, etc), which are often slow. This option is also very useful if you author documents stored on the local filesystem, but containing a large number of images. Images stored on remote filesystems (e.g. WebDAV, FTP, etc) are loaded after the body of the document, in a background task. Images stored on the local filesystem are loaded at the same time as the body of the document. Display the image normally, that is, possibly scaled if this has been specified using attributes such as width and height. Show the bounding box of the (possibly scaled) image and, if there is enough room in this rectangle, also show a thumbnail (at most 128x128 pixels large). This option allows to avoid out of memory errors when opening documents containing a large number of high-resolution images. Show the bounding box of the (possibly scaled) image. This option allows to speed up opening documents containing a large number of high-resolution images. Note that options "as thumbnails" and "as bounding boxes" have no effect on images having an intrinsic size smaller than 32x32 pixels. Such small images are always displayed normally. Font family and font style, but not the font size which is computed using "Base font size".